Frailty is a recognized medical syndrome that affects 7% to 16.3% of individuals aged 65 and older.1 This chronic progressive condition is characterized by disregulation of multiple body systems, particularly the brain, endocrine, immune, and skeletal systems. Abnormal results in any three or more systems is a common predictor of frailty—more so than abnormalities in any one particular system.2 Patients with a frailty diagnosis have an amplified vulnerability to adverse outcomes such as increased hospitalizations, falls, decreased functional status, institutionalizations, and death. In 2001, Fried and colleagues3 identified and introduced the frailty syndrome as a unique phenomenon. Fried initially reported unintentional weight loss, defined as the loss of more than 10 pounds in one year, self-reported exhaustion, slow walking speed, weak grip strength, and physical activity as primary criteria for a frailty diagnosis. Prior to Fried, providers and clinicians used the failure to thrive diagnosis to reference the combination of symptoms that eventuated a trajectory toward death. Today, much more research has been completed on frailty syndrome, allowing providers to more easily isolate the syndrome and discuss appropriate care options with patients and families based on prognosis. Frailty is considered to be a geriatric syndrome of weakness, weight loss, and low activity associated with adverse health outcomes. It is viewed by researchers to be a cumulative burden of illness, cognitive, social, and psychological decline.4 While the presentation of frailty syndrome can vary depending on the assessment tool, it is most commonly characterized by increased inflammation; decreased immune function; anemia; increased insulin resistance; decreased levels of insulin growth factor-1; sarcopenia; decreased energy levels; and depression. Low-grade chronic inflammation and impaired immune response have for some time been noted as important factors that increase patient susceptibility to certain chronic disease states such as cancer, diabetes, congestive heart failure, atherosclerosis, chronic obstructive pulmonary disease, osteoporosis, and sarcopenia. Additionally, increased inflammation is associated with lower muscle mass and strength, and increased functional decline.5 Not surprisingly, the abnormal presence of the inflammatory marker interleukin 6 (IL-6), along with elevated white blood cell (WBC) counts, often just on the high end of the normal range, have been associated with frailty.6 Therefore, assessing and monitoring for changes in systemic inflammation, specifically in IL-6 and WBCs, may be helpful to providers in identifying patients at greatest risk for frailty syndrome. Unfortunately, laboratory testing may be cost prohibitive for some patients. One national laboratory quoted a basic WBC test at $40 while an IL-6 test costs about $290. Independent of other morbidities, anemia is recognized as a significant contributor to mortality in older adults. This is due to the negative impact of hypoxia on brain and organ function along with protein synthesis. While older adults with a history of cigarette smoking and alcohol use tend to have lower hemoglobin levels, low levels have been associated weight loss, exhaustion, decreased walking speed, decreased grip strength, cognitive impairment, functional limitations, and depression—all factors associated with frailty.7 Due to the high association between comorbidities and frailty, it may be prudent for providers to consider treating anemia falling within low to normal ranges in patients with three or more health conditions. Another health condition of particular concern is diabetes. Individuals with diabetes have a 50% increased mortality risk compared with patients without diabetes.8 This is most often due to the cardiac and renal complications associated with the disease that affects more than 29 million people in the United States, according to the Centers for Disease Control and Prevention. More troubling than the identified patients with diabetes who are undergoing treatment are the estimated 86 million individuals considered to have prediabetes, or increased glucose levels that fall below the diagnosis point for diabetes. Altered glucose levels and insulin resistance are associated with increased frailty outcomes.9 Regular screening along with nutritional counseling and directed weight reduction plans can have a significant impact in lowering comorbidity and mortality risk. 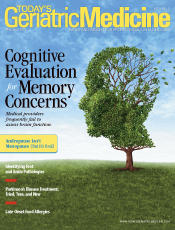 Although major depressive disorder is not a common condition among older adults, approximately 15% of community-dwelling elders experience depressive symptoms13 that may include significant weight changes or change in diet, changes in activity, fatigue or loss of energy, and diminished ability to think or concentrate—symptoms also common in frailty. Screening for depression should be a routine component of elder care with cognitive behavioral therapy and antidepressant treatment prescribed as appropriate. Pain should also be ruled out as a causative factor of depressive symptoms. At present there is a voluminous expansion of instruments being used to assess frailty. At least 15 screening instruments are routinely mentioned within the literature; however, the four most commonly used and cited are The Hopkins Frailty Score (Fried's Frailty Phenotype),3 The Deficit Accumulation Frailty Index,14 The Clinical Frailty Scale,15 and The Edmonton Frail Scale.16 There is a variety of assessment domains found within the instruments, which are often dependent upon intended practice area and utility. The total number of items within the tools can range anywhere from five to more than 47. The most frequently used domains include physical function, medical diagnoses, cognitive ability, nutritional status, psychological state, sensory deficits, social supports, economic status, and residential environment. Unfortunately, there is no consensus on how researchers and providers should attempt to consistently measure the features of frailty syndrome, which has led to a general disagreement among experts. However, the major benchmarks outlined by Fried3 provide good utility in a variety of settings (see Chart 1). Frailty syndrome is a progressive condition that ultimately leads to death. In addition to the previously noted assessments and recommended treatments, it is important for providers to note that the syndrome develops in stages that range from prefrail to acute end-stage frailty (see Chart 2). Treatments are best focused within the prefrail phase, if not earlier. Essentially, all older adults should be considered at risk for frailty and offered preventive care based on the treatment goals of increased physical activity, increased strength, increased exercise tolerance, and improved nutrition. To meet this end, baseline data on functional status and care needs should be collected and routinely monitored, with appropriate referrals for physical therapy and assistive services. By educating older adults and their families about frailty and anticipated declines in functional status, older adults can be more proactive in self-management of the comorbidities that may exacerbate frailty, and they can utilize supportive services sooner rather than later. Frailty is the anticipated culmination of multiple comorbidities. While decline due to frailty may be slowed, it is not necessarily reversible. When patients begin to exhibit multiple comorbid conditions that include diabetes, cause recurrent infections, weight loss, and diminished functional status that necessitates care assistance in normal activities of daily living, it is prudent to consider comfort as a primary care goal. At this stage, hospice and palliative care options should be introduced to families as these services provide extensive physical, social, psychological, and spiritual support during what may become an extended transitional period. — Sheria Grice Robinson, RN, MSN, MHA, CHPN, is an education specialist at the Hospice of Michigan Institute and a doctoral candidate at Wayne State University in Detroit. — Susan Bushinski, DNP, RN, ACNP-BC, FNP-BC, is an assistant professor of nursing at Eastern Michigan University in Ypsilanti. 1. Rodriguez-Manas L, Fried LP. Frailty in the clinical scenario. Lancet. 2015;385(9968):e7-e9. 2. Clegg A, Young J, Iliffe S, Rikkert MO, Rockwood K. Frailty in elderly people. Lancet. 2013;381:752-756. 3. Fried LP, Tangen CM, Walston J, et al. Frailty in older adults: evidence for a phenotype. J Gerontol A Biol Sci Med Sci. 2001;56A(3):M146-M156. 4. Espinoza S, Walston JD. Frailty in older adults: insights and interventions. Cleve Clin J Med. 2005;72(12):1105-1112. 5. Li H, Manwani B, Leng SX. Frailty, inflammation, and immunity. Aging Dis. 2011;2(6):466-473. 6. Leng SX, Xue Q, Tian J, Walson JD, Fried LP. Inflammation and frailty in older women. J Am Geriatr Soc. 2007;55(6):864-871. 7. Juárez-Cedillo T, Basurto-Acevedo L, Vega-García S, et al. Prevalence of anemia and its impact on the state of frailty in elderly people living in the community: SADEM study. Ann Hematol. 2014;93(12):2057-2062. 8. Centers for Disease Control and Prevention. National Diabetes Statistics Report: Estimates of Diabetes and Its Burden in the United States, 2014. Atlanta, GA: US Department of Health and Human Services; 2014. 9. Kalyani RR, Varadhan R, Weiss CO, Fried LP, Cappola AR. Frailty status and altered glucose-insulin dynamics. J Gerontol A Biol Sci Med Sci. 2012;67(12):1300-1306. 10. Morley JE, Malstrom TK, Rodriguez-Mañas L, Sinclair AJ. Frailty, sarcopenia, and diabetes. J Am Med Dir Assoc. 2014;15(2):853-859. 11. Morgan K. Nutrition, resistance training, and sarcopenia: their role in successful aging. Top Clin Nutr. 2012;27(2):114-123. 12. Beaudart C, Buckinx F, Rabenda V, et al. The effects of vitamin D on skeletal muscle strength, muscle mass, and muscle power: a systematic review and meta-analysis of randomized control trials. J Clin Endocrinol Metab. 2014;99(11):4336-4345. 13. Fiske A, Wetherell JL, Gatz M. Depression in older adults. Annu Rev Clin Psychol. 2009;5:363-389. 14. Rockwood K, Mitnitski A. Frailty in relation to accumulation of deficits. J Gerontol A Biol Sci Med Sci. 2007;62A(7):722-727. 15. Rockwood K, Song X, MacKnight C, et al. A global clinical measure of fitness and frailty in elderly people. CMAJ. 2005;173(5):489-495. 16. Rolfson DB, Majumdar SR, Tsuyuki RT, Tahir A, Rockwood K. Validity and reliability of the Edmonton Frail Scale. Age Ageing. 2006;35(5):526-529.